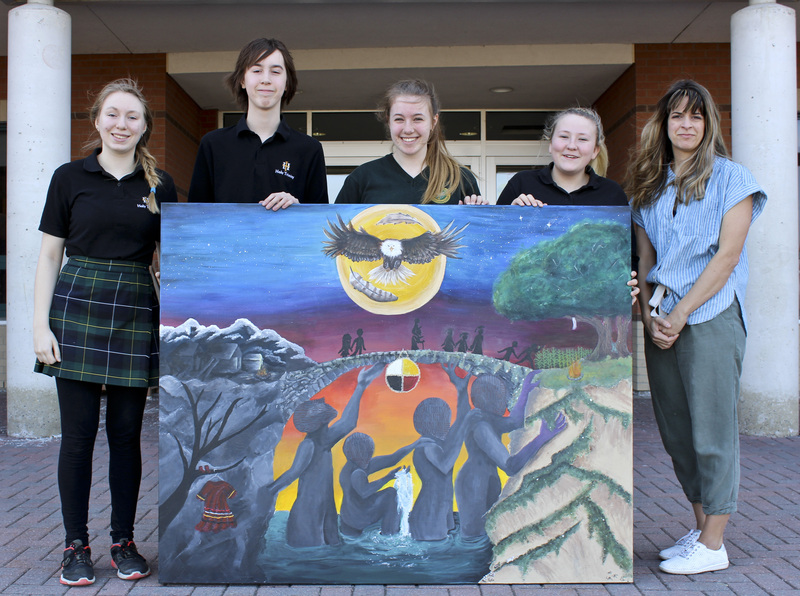 Holy Trinity Catholic Secondary School visual art students recently took part in a national initiative called “Imagine a Canada” to demonstrate their vision of what Reconciliation could be. The project was launched by The National Centre for Truth and Reconciliation (NCTR) with the objective to call young people from across the country, from kindergarten to grade 12, to lead the nation in Reconciliation through poetry, music, art, writing, and other creative endeavours. In recognition of their outstanding creations, one young person from each province and territory has been invited to act as Reconciliation Ambassadors at the National Leadership Workshop and Ceremony celebrating Reconciliation. Under the supervision of Visual Art teacher Renee Lalande, students created visual representations of their vision of Reconciliation. The paintings were designed with the help of two Indigenous Community Partners, Theresa Cook, a Mohawk knowledge keeper from Akwesasne and Kokum Brenda Rivers who carries Cree teachings. Both work with the CDSBEO through the Traditional Teachings in the Classroom initiative. With their knowledge, they helped the students with symbolism, and shared their insights into Indigenous spirituality. The CDSBEO Indigenous lead, Marian Lawson-MacDonald as well as Holy Trinity CSS Indigenous Studies teacher, Caterina Pettinella, were also instrumental in the design due to their knowledge of Indigenous history and symbolism. Ultimately, Holy Trinity CSS students submitted two art pieces, and one painting was chosen. 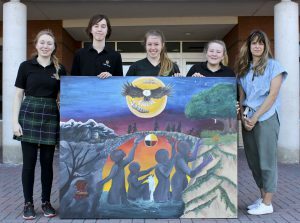 The painting was created by students; Matthew Hughes (grade 10), Chloe Larose-St. Onge (grade 11), Alyssa Lunny (grade 11), and Erin McCready (grade 11). Alyssa Lunny was chosen by her group to represent their submission at the “Imagine a Canada” national arts and leadership initiative to be held in Winnipeg on May 1-3, 2019. As the selected honouree, Alyssa, and her mother, Lisa Lunny, are invited to attend an opening feast in Winnipeg on May 1st, followed by two days of leadership training at the Turtle Lodge, including youth-led leadership discussions, an honouring ceremony and a feast to celebrate the artistic submission. Honourees will have their submission displayed at the honouring ceremony on May 3rd, and will have the opportunity to speak about their art piece. The NCTR was created to preserve the memory of Canada’s Residential School system and legacy. It officially opened in the summer of 2015, and is the permanent home for all statements, documents, and other materials gathered by the Truth and Reconciliation Commission of Canada.